Occasionally runs around then leaps back to its owner, leaving behind a sparkling trail of blue dust. Players can emote /dance while targeting Moon Moon and it will call down a beam of moonlight and dance with them. Moonfang spawns on the Darkmoon Island (about once an hour), which is accessible only when the Darkmoon Faire is open. This mob is an elite raid boss, can be tagged by all players, and awards personal loot. Moonfang will only spawn after certain conditions have been met. 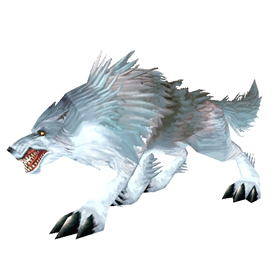 Moonfang Snarlers will spawn roughly every hour, and after a sufficient number of them have been killed, Moonfang Dreadhowls will then spawn. If players kill enough of these mobs, Moonfang will then spawn. A zone-wide warning will sound when she appears, and when she is defeated. Players can kill and loot Moonfang multiple times per day on any character, however sometimes players will not find anything to loot from Moonfang's body. This appears to be a common occurrence, and is likely due to the fact that Moonfang's loot table is limited (containing mainly unique-bound items). If nothing drops on a kill, simply try again. Bites the enemy with arcane power, dealing 433 Magic damage. Unfortunately I have farmed this beyond count, my RNG luck is rather impressively poor! So when I saw this cheaply listed on AH, I caved and bought this for 20k, which is rather cheap on my server and I probably made someone's day with that sale! Since today was the first day of the Faire, and I don't have Moon Moon yet (never even tried), figured I would server hop all day to get him. Every kill, we had about 15-20 people, and I noticed 1 or 2 Moon Moon's would drop, a couple times none dropped. I got it on my 9th kill of the day. Who brought f***ing Moon Moon along?! XD That is the first thing I thought of! Lol so glad I read the story behind it, I actually did laugh out loud! Three nice breeds to chose from, all with some benefits. Moon Fang, though 85% hit, will hurt very very much, can two-shot fliers even without crits. Crouch is superior on the S/S breed but not useless by a longshot on the others. Howl of course can be a game winner. Moon Tears makes this wolf useful in a Moonlight team, while the dance can be really powerful combined with the right partners. Truly solid pet, not much wrong with it at all. I won this auction on my server for 2500 gold. That was the starting bid and that's what I got it for (no one bid for two days). Putting this here in case anyone is curious about the auction price. I see it listed for 10K all the time but no one seems to buy those. I spend most of my time buying and selling pets in between all my dailies so I am getting a good feel for what everything sells for. 3000 gold seems to be a good price. Took about 20 kills but I finally got little Moon Moon <3 Such a cute pet. It's really fun to use Moonfangs Paw and dance with Moon Moon. As others have said, you just have to hit Moonfang once to loot her. Additionaly, even if you're dead when Moonfang dies, you can still loot her once you rez. Luck was shining on me tonight. On my 3rd ever attempt, I got Moon Moon. 2 hours later, got him again, and my guildie also got him. I gave the 2nd to a friend. Lucky tonight for sure. Lightbringer server. It was about 7pm and then 9pm respectively. W00T! Just got mine today, same day I got Darkmoon Rabbit. The trick is, even a lvl 1 can get it. You just need to attack it once and stay alive, even if you miss....everyone who tags it gets a chance to loot. I got it on my 4th or 5th loot attempt. Seriously lucky to get my Moon Moon on my first kill!!! I have been wanting a pet of this model wolf for years. It matches my favourite hunter pet too! I love Moon Moon! 17 kills & no Moon Moon...Hopefully soon, hopefully. @Berenzen: Moonfang sitting untouched for 90 minutes is in no way a dead realm. On Scarshield Legion we had to drag together literally half the online level 90 characters on the Horde side to kill it, resulting in a magnificent raid of 16 people. Assuming there's no level restriction for looting, creating an alt on a high pop realm and parking that on the Darkmoon Island may be the best approach for low pop people. There are no hostile mobs on the island anyway. Great thing about this raid boss, everyone who hits her will get loot (if their is loot for you, sometimes there is not). I killed her 12 times before I seen a Moon Moon drop. On a PvP server this is even more of a pain to get, best I can sugest is roll on a non PvP server, hit her, lay dead till she goes down, rez run back, and loot (this has worked for me several times). Oddly enough she droped Moon Moon while I was on my PvP server though lol. /dance with Moon Moon is pretty cool! Ok so I'm not sure what the spawn rate on this guy is- but its not impossible. I fought Moonfang 10 times today and got 3 moon moons. You can have multiple ones in your bags unlike all the other items she drops and you can sell extras by caging it. Also, I found if you are having trouble looting her, as long as you can click her once, (even if nothing shows up in your loot window) you'll get a message in the mail from the post master saying you forgot something with the item you won. Moonfang spawns on the northwest corner of the island. It's on a 1 hour spawn timer. Little adds will spawn all over the island kill those and then it will yell zone wide that the larger add is spawning kill it and then yells zone wide again when moonfang spawns and at some point it spawns tons of little adds which persist through death.The drop rate seems good. Guildy and myself both got on the second kill.Seems to spawn in the same location every time and is tradeable. Moonfang's cubs grow into massive, slavering, black-furred killing machines...except for Moon Moon.